Some writers have lived their entire life churning out books out of blood,gore and suspense. The notable works of them still occupy our minds and leaves an ever lasting impression about their efforts and spirit of keeping the art alive. 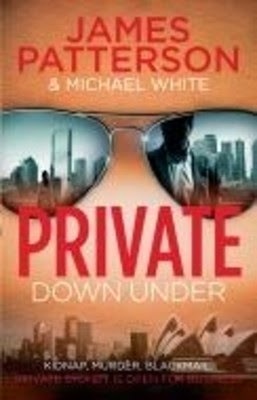 Author James Patterson & Michael White bond together under the Private series with a new location "Private Down Under" to make people dance to their tunes. So will this new book in the series work it's charm? Let's find out. With the best detectives in the business, cutting edge technology and offices around the globe, there is no investigation agency quite like Private. Now, at a glittering launch party overlooking the iconic Opera House, Private throws open its doors . . . Within days the agency's case load is full: from a missing businessman whose latest scheme was a step too far; to a rock star terrified hes next in line for the infamous Club 27. First look at the title and the cover and it oozes class and suspense. The skyscrapers of Australia a woman and a man and the overall glare effect adds to the imposing effect of the book. The blurb talks about Private's latest developments in Sydney and once again how they are engaged in deadly situations. The blurb manages to conceal it all and let the readers decipher the entire mystery of the book. The story starts off in Sydney where Private has set up a new office under Chris Gisto. Along with his team they are embroiled in a problem when a body ends up on their doorstep. After that a series of murder occur in eastern Suburbs and a rising star approaches them for help for his probable murder and a Chinese ex-cop also lands up at their doorstep it all becomes complicated. So will Private be able to live up to their reputation and wade off all the cases? Are all the cases connected to each other? Will their be calm or will their be bloodshed towards the end? That's what the story is all about. The furious pace is the first noticeable element of the story. The parallel plots another aspect of the entire book. The gore and the bloodshed adding to the mystery and creating an overall eerie in the minds. The ruthless encounters, the tacts, the joint operations, the nosy yet dangerous ventures giving the book much more leverage. The mixture of kidnap, murder and betrayal working in tandem all the time and giving the readers a lot to savour. Private as a team has been given enough space and works overtime in the book with their fancy gadgets and minds. The downside of the book is when few of the plot fell short of expectations. Some finishing awkwardly and not providing enough spark and charm to the entire idea. The local dialect of Australia missing except for the scenery. The predictability bit high and towards the end the story falling short of weaving magic in the minds of the readers. Gisto's importance was found more wanting in the book. Other Private members overshadowed Gisto completely which doesn't makes a strong case for the protagonist. All in all the book does manages to pull off some inexplicable ideas out of the bag. But the shine fizzles out completely and that doesn't helps the cause. The story has it's ups and downs and could have been dealt with much more severity. The grip loosing at times. But the idea of making people go through a series of maze works and makes momentous leaps before coming to a stop. A bold and a clever book.